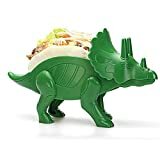 If you thought the coolest taco holder ever was the TriceraTACO, then feast your taco and dinosaur loving eyes upon this cool new TacoSaurus Rex Taco Holder. 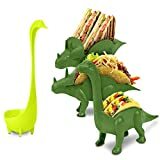 The monstrous king of all dinosaurs has been brought back from prehistoric extinction and shrunk down into a miniature yet quite ferocious taco holder that supports two hard taco shells upright on its back or even two sandwiches, waffles, toast, and more. 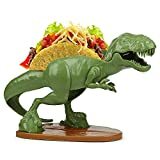 A great way to have *ahem* a roaring good time at your next Taco Tuesday. Try it with Waffles, Toast, Sandwiches, Ice Cream Tacos, P&J Sandwich, Crackers, and more! 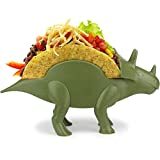 Makes Meal Time Fun for All Ages!